Metabolism of public organization is a managerial approach to explain the utilization and transformation of inputs (mainly public funding) to produce and supply products and services in order to reduce costs and increase the efficiency of organizations in competitive markets. The concept of metabolism, in a broad analogy, can be applied from biology to public management to analyze processes running from inputs to outputs in organizations and explain how public organizations use economic resources provided by governments to produce/supply outputs and services in society. The concept of metabolism is uncommon in the studies of management and a brief background is useful to clarify it. In biology, metabolism indicates chemical processes that, in living organisms, transform food and drink into energy. The concept of metabolism in a context of Generalized Darwinism in science can explain how complex systems – e.g., organizations – function and behave. Metabolism has a vast use in several disciplines, such as industrial ecology, urban geography, economic geography, ecological economics, etc. (Coccia 2018a). Metabolism of public organizations is a new approach for analyzing the use of inputs (e.g., public funding) to support production, operations, and survival of these organizations in turbulent markets. This approach can also detect organizational problems for designing best practices of public management directed to control and improve the allocation of public funding and other inputs for increasing the efficiency of public organizations themselves (Coccia 2018a). Next section presents a theoretical framework of this new approach for cost analysis of public organizations. Inputs: human resources, equipment, public funding for research, etc. Production process transforms inputs into outputs in labs. Outputs: publications, software, patents, innovative outputs, etc. The system of public research organizations is represented in Fig. 1 with a linear model of metabolism. This approach can identify how public funding for research is used within public research organizations to analyze possible causes of organizational efficiency or inefficiency. 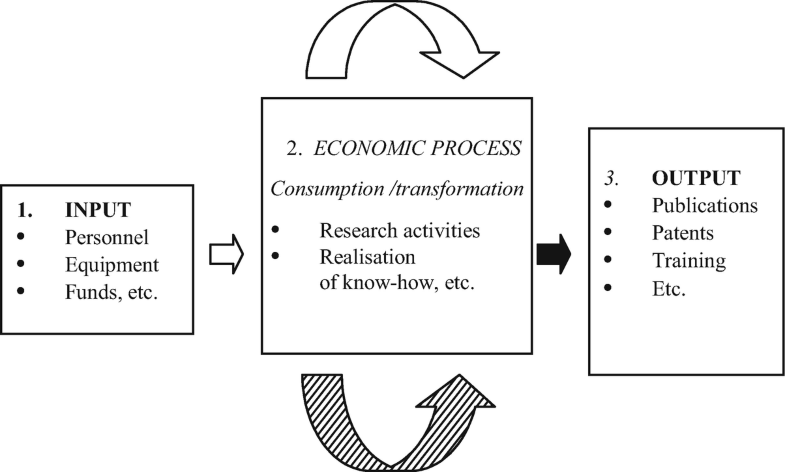 Especially, the approach of metabolism here can support managers to analyze costs and design appropriate best practices of R&D management directed to increase efficiency and productivity of public research labs in the presence of scarce economic resources (Coccia 2009, 2016, 2018b). Firstly, the preliminary analysis of the metabolism of public organizations is given by descriptive statistics, trends, and bar graphs that represent the arithmetic mean of variables on y-axis and inputs (public funding, etc.) on x-axis. In particular, Eq. (2) indicates the proportion of the cost of an input (personnel) on total revenue; this is a main indicator of the consumption of public funds in PROs for specific inputs. Similar coefficients can be calculated for other inputs divided by revenue of PROs. An application of the approach of metabolism of public organizations is on the largest public research body in Italy: The National Research Council of Italy or Consiglio Nazionale delle Ricerche (in short, CNR) that has an organizational behavior similar to other research institutions in Europe, such as CNRS in France, CSIC in Spain, etc (Coccia 2014). The sources of data are the annual financial statements of the CNR. Results of this approach of metabolism, based on data from income statement of the Italian National Research Council (CNR) over 1997–2015 period, are as follows. Figure 2 shows main components of cost of the CNR; the highest level of cost within this PRO is given by the cost of personnel, followed by cost of service, materials and products, leased assets of third parties. In particular, the cost of personnel is mainly based on salary and social security taxes. Therefore, the analysis here, considering this preliminary result, focuses on critical factor of the cost of personnel to assess the processes of metabolism within this public research organization under study, and as a consequence, its organizational and managerial behavior (cf., Coccia and Rolfo 2010, 2013; Coccia and Cadario 2014; Coccia 2014). Figure 3 shows that the proportion Mt (Eq. 2) of the cost of personnel on total revenue (state subsidy) within this PRO (i.e., CNR) is growing over time and in 2015, it absorbs more than 65% of total revenue received by government. Table 1 shows the growth rate of economic factors of the CNR based on Eq. (3). Results indicate, from 1997 to 2015 period, that the cost of personnel has a very high growth rate (167.87), total cost of CNR has a high one (127.44), whereas total revenue (state subsidy) has a lower growth rate: 118.72. This result suggests an imbalance of growth rates between total revenue from governments and vital costs within this PRO. This imbalance of growth rates can be the source of economic issues for this public organization in the course of time. To sum up, the analysis of the metabolism seems to reveal that this public research organization absorbs a substantial proportion of public funds (state subsidy and public contracts) to cover high costs of personnel over time. Overall, then, the approach of metabolism applied on this research institution suggests possible organizational inefficiencies, driven by high costs of personnel in the long run. The metabolism of public organization can reveal critical organizational and managerial issues, such as public research organization described above absorbs a high share of the total revenue for the cost of personnel, generating economic problems and several organizational inefficiencies over time. This result is also due to a public research system in Italy that has rigid research organizations to cope with public rules of budget balance that generate cuts of public funding from governments to research organizations (Coccia 2018a). This approach provides main information for public management of the PRO under study that has to control the growth of the cost of personnel in the presence of shrinking public research lab budgets to support efficiency and sustainability of this research body in the long run. Hence, the approach of metabolism proposed here can be a useful managerial technique to analyze costs and design best practices of public management directed to support efficiency of public organizations in turbulent markets.